"I recently have discovered fiddlehead ferns. I could not find a recipe for them so, I made one up. These are so yummy that I can eat the whole dish in sitting! Great served with fish." Bring a large pot of salted water to a boil. Cook fiddlehead ferns in the boiling water until barely tender, 7 to 10 minutes; drain. Heat olive oil in a large skillet over medium-high heat. Stir in the prepared fiddlehead ferns, garlic, and the salt and pepper. Cook and stir until ferns are tinged lightly brown and tender, about 5 minutes. Remove from heat and sprinkle with lemon juice. Delicious. Very fresh tasting! I added just a little butter to my olive oil too. My husband liked them without the lemon juice; I liked it without, but preferred them with the lemon. Thanks! Don't bother boiling the fiddleheads first. They are crispy and delicious sauteed. Try stir frying them with all of your favorite vegetables or in fried rice. 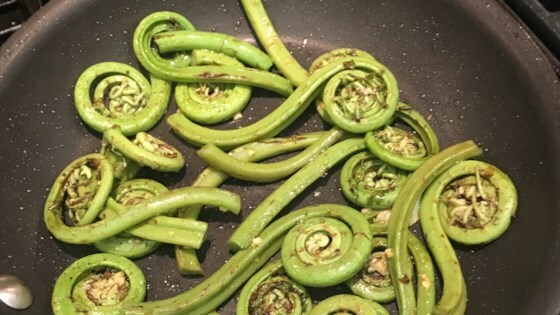 This was my first time preparing fiddleheads, and I found this recipe a nice n' easy introduction. I may add a splash of balsamic next time. This was an easy recipe and we loved it. It was my first time cooking fiddleheads and I'm sure we'll make it again. Thanks! I had this at a friend's house and they were delicious. Like another reader, my friend added a little butter while sauteeing them and tossed with toasted pine nuts before serving.